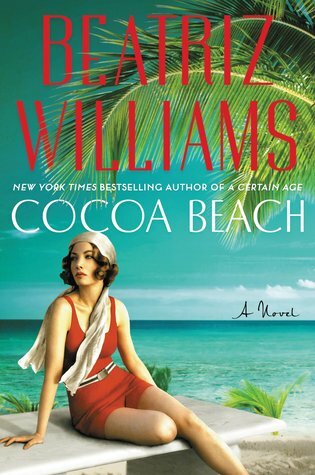 Goodreads says, "The author of A Certain Age transports readers to sunny Florida in this lush and enthralling historical novel—an enchanting blend of love, suspense, betrayal, and redemption set among the rum runners and scoundrels of Prohibition-era Cocoa Beach. Burdened by a dark family secret, Virginia Fortescue flees her oppressive home in New York City for the battlefields of World War I France. Driving an ambulance for the Red Cross, she meets a charismatic British army surgeon whose persistent charm opens her heart to the possibility of love. As the war rages, Virginia falls into a passionate affair with the dashing Captain Simon Fitzwilliam, only to discover that his past has its own dark secrets—secrets that will damage their eventual marriage and propel her back across the Atlantic to the sister and father she’d left behind. Five years later, in the early days of Prohibition, the newly widowed Virginia Fitzwilliam arrives in the tropical boomtown of Cocoa Beach, Florida, to settle her husband’s estate. Despite the evidence, Virginia does not believe Simon perished in the fire that destroyed the seaside home he built for her and their young daughter. Separated from her husband since the early days of their marriage, the headstrong Virginia plans to uncover the truth, for the sake of the daughter Simon has never met. Simon’s brother and sister welcome her with open arms and introduce her to a dazzling new world of citrus groves, white beaches, bootleggers, and Prohibition agents. But Virginia senses a predatory presence lurking beneath the irresistible, hedonistic surface of this coastal oasis. The more she learns about Simon and his mysterious business interests, the more she fears that the dangers surrounding Simon now threaten her and their daughter’s life as well." I was so ecstatic to hear Beatriz Williams has another novel coming and one set in sunny Florida. Yes, please! Don't you just love the cover? I already have plans to take this one along with me to the beach over 4th of July weekend! What do you guys think? Great pick! This sounds perfect for summer reading. I know, right?! That's what I was thinking; plus, you can't go wrong with Beatriz Williams! Thanks for visiting, Christina! An enthralling blend of romance and suspense is just the kind book I'd like to read! Enjoy, Christina. I can't say I've read any book by this author yet. I'll be on the lookout for your review! Me too, Joy! I definitely think you should read her...start with A Hundred Summers - an excellent read. Thanks for visiting! I LOVE this cover, too! Definitely one of my favorites. I could use some sunny Florida right about now. Thanks for visiting, Becky! I haven't read anything by this author, yet, but her books always sound interesting. I hope you love this one. Great pick! I love that cover! I think you'd like her, Natalie. If you do get a chance to read any of her novels, I'd start with A Hundred Summers...a great historical "beach read" and my favorite of her novels. Thanks for visiting!